The small community of Quincucirca is located outside of the town of Sorata about 100Km from La Paz. A few houses in this community gets drinking water from the town of Sorata and the rest of the community lives without drinking water. Mr. Stefan Anders, a baker who immigrated from Switzerland, established himself in Quincucirca and runs Illampu Cafe. Mr. Stefan seeing the need of the villagers, he started raising a trust fund from Swiss families in Switzerland. 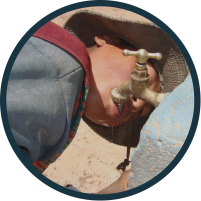 To date, he raised about $15,000 for design and construction of potable water system for the village of Quincucirca. To help accomplished this dream, he approached EIA with his problem and hoping to find a probable solution. This situation was presented to EWB-USA, and it was adopted by the EWB group of University of California at Davis (UC Davis) in January 2010. 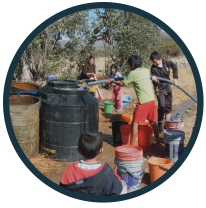 Since then, UC Davis has made several approaches for design and has resolved the existing issue of potable water source rights from the communities located upstream of the watershed. They teamed up with Bolivian university students of Universidad Privada Boliviana (UPB) to address the design. UPB students came up with a possible solution which is being reviewed by EIA and planning to be implemented in this year.